Two of the most prolific cow families of GCC where combined in producing GCC Legacy. His sire, GCC Total Recall has proven to be a calving ease wonder producing cattle that come easy with vigor and eye appeal, later developing into big bodied brood matrons. The 066 cow family has produced more dollars and cornerstone females at GCC than perhaps any other. With a car- bon copy image of GCC Total Recall, Legacy will add maternal greatness, genetic improvement, and eye appeal into your cow base. 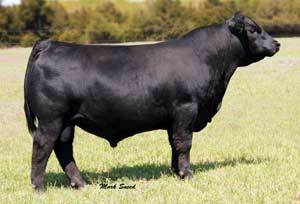 Legacy has a 69 lbs BW,724 lbs WW and a pedigree of consistent calving ease and doability. He is the go to calving ease sire for this coming breeding season. Don ’t gamble on that first calf crop, use Legacy to make females destined for the keeper pen.